How do you improve on perfection? Well, if you’re Amazon, you take your best-selling device, add a few extras, throw in a smart bulb, and give it a cool new name. And that’s just what they did with the unveiling of the Echo Plus, which will be available to shoppers starting October 31st of this year. Sleeker, bolder, and with a built-in smart home automation hub, it’s sure to be a staple in every home. Check out our Echo Plus review and find out what makes it the next great thing. There are a lot of great smart speakers on the market, but none come close to Amazon’s line of devices. From the Echo to the Show, each one has something different and amazing to offer; and their latest offering, the Echo Plus, continues in that tradition, delivering exceptional design and function. Modeled in a similar fashion to the original Echo, it has a polished finish, improved sound and a built-in hub that makes controlling other devices easier than ever. For me, the hub is the biggest improvement, allowing for a smoother, simpler process that cuts out additional costs or the need for another device. After all, the point of a smart speaker is to make everyday tasks a breeze and that’s just what the Plus does. The Echo Plus is a work of art, from the stylish outer-casing to the improved acoustics and ready-to-go smart center. At a glance, these improvements and added features seem small, but in reality, they are monumental. The improved sound clarity means you can listen to music or speak to Alexa easier while having a hub in the device means you can plug in the Plus and start giving instructions. I love the look of the Echo Plus and odds are you will too. Modern, simple, and fun, it measures 9.3″ x 3.3″ x 3.3″ and weighs 33.6 oz. The outside is a matte silver, with small, circular perforations across the bottom half that gives the impression of a speaker (which is kinda clever when you think about it). 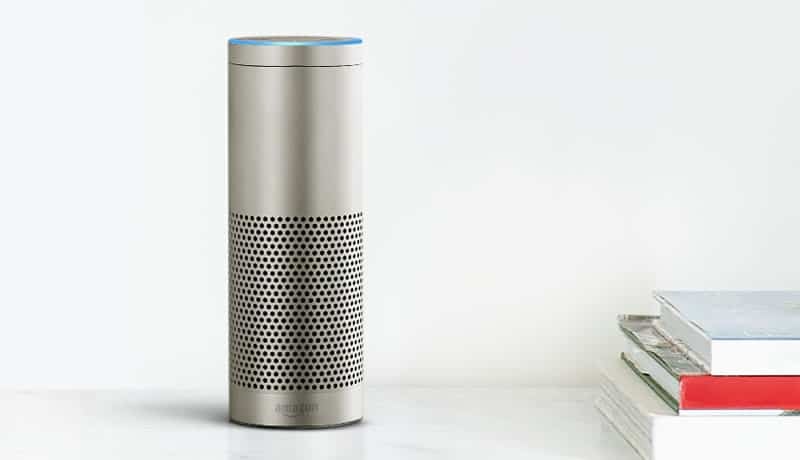 And of course, the top has the tell-tale blue ring that lights up whenever you engage Alexa. Now in the past, I’ve complained about the height of the Echo, so the fact that the Plus is even taller is a bit of a bummer for me. However, they took the style up a notch, so I’m willing to overlook this small inconvenience. Hey, I just won’t put it on my bookshelf and I’ll clear a spot on my kitchen counter. From eliminating the need for a separate hub to incorporating superior sound elements, there are key features that make the Plus, well, a plus. Here’s what makes it a great investment. One of the best features of the Plus is the speaker and microphone upgrades. The 2.5″ speaker and 0.8″ tweeter deliver 360-degree sound, which is perfect for parties or just rockin out in your pj’s. The sound resonates, producing deep, feel-it-in-your-bones bass and sharp vocals that will have you and everyone else boppin to the beat. And with the new multi-room music feature, you can play whatever you’re listening to on every Echo device in your house or a different song in every room. In addition to the booming speakers, the Plus also boasts an incredible microphone system that uses beamforming and noise-canceling technologies for superior range and voice recognition. So, you can ask Alexa to turn off the lights or give you the weather in the middle of a noisy room and she’ll do it with ease. And just like your other Echo models, the Plus works with Amazon Music, iHeartRadio, Spotify, Pandora, TuneIn, and more. The addition of a smart-hub built into the Plus is a huge advantage because it makes the whole process of setting up and controlling smart devices hassle-free. Just ask Alexa to “find your compatible devices” and she’ll recognize and sync them effortlessly. From locks and cameras to bulbs, thermostats, and lighting, Alexa can set them up and have them ready to go. You can set up timers and schedules for multiple devices, turn your lights on and off while in bed or adjust the thermostat while cuddled up on the couch. And since you don’t need a separate hub you save money and time as there is no additional equipment to buy or program. The hub is compatible with Philips Hue, Zigbee lights, and door locks, GE, Kwikset and others. If you haven’t automated your house yet, the Philips Hue Bulb that comes with the Plus is a great way to test out how well smart automation works for you. Just screw in the bulb and ask Alexa to discover it, then have some fun dimming the lights while lying in bed. Along with all these great new features, the Plus can still do everything the other Echo models can, from ordering an Uber to telling you a joke. The Plus just does it better. It can be used as the ultimate party speaker or a smart home controller without skipping a beat and it does it all in style. The all-new Alexa Routines is a real “plus,” allowing you to use one voice command for a series of actions. For instance, say “Alexa, good afternoon” and she will turn on the lights, turn down the thermostat and turn on the TV. All you have to do is set up what actions go with what command and set a schedule, say every weekday at 9 am, and Alexa will do the rest. See Echo 2nd speaker as a lower price alternative. So, where does the Echo Plus rank compared to Amazon’s other upcoming devices? Well, as you’ll see in a minute, it comes in ahead of all of them. Looking at the Echo Plus side by side with the Echo 2nd Generation and the original Echo, it is the top choice for 2 big reasons: the built-in hub and size. Versus the echo 2nd Generation and Echo it is shorter, so it fits easier on shelving and other tight areas. And while the 2nd Generation has more custom looks and the same audio system, it doesn’t have the hub, putting it at a disadvantage. The original Echo, meanwhile, lacks the updated look, has no built-in hub, and while the audio is good, it doesn’t stand up to the new system. For these reasons, the Echo 2nd Generation is the obvious choice for consumers. I think having read our Echo Plus review you’ll agree that this latest device is another great idea come to life from Amazon. From the flawless design to the impeccable features, there is nothing but positive things to say about the Plus. The affordable price, coupled with its impressive features make this a deal too good to miss. Pre-orders start now, so if you’re interested to get one today. Best Echo Gift Ideas with Valentine's Day Sale Sure to Put your loved in the Mood..for Fun! Zmodo Greet vs Ring WiFi Doorbell Comparison: Defend Your Home With Our Top Pick!